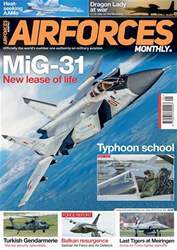 The unmistakeable shape of Russia’s MiG-31 interceptor adorns the cover of our May issue. Russian aerospace expert Piotr Butowski examines the status of the Cold War-designed Foxhound, a fighter which returned to the news as the launch platform for one of Russia’s new ‘super weapons’ – the Kinzhal hypersonic missile. Other frontline fighters include Swiss Air Force F/A-18s and F-5s, hosted at Meiringen as the air base had a final chance to play a part in the protection of airspace during the World Economic Forum at Davos. 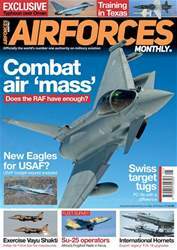 Preparing Royal Air Force fighter pilots for the front line is the job of No 29 Squadron at RAF Coningsby, Lincolnshire. 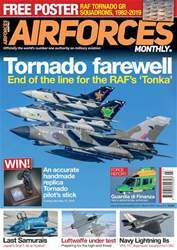 AFM’s Assistant Editor Jamie Hunter concludes his two-part feature on the making of a Typhoon pilot. Fighters like these are nothing without their armament, the most ubiquitous of which remains the short-range air-to-air missile (AAM). 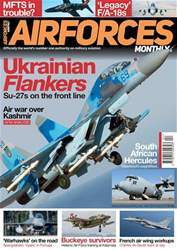 Douglas Barrie and Piotr Butowski launch a review of the heat-seeking AAMs in service around the world. The US Air Force’s U-2 ‘Dragon Lady’ spyplanes have played a key intelligence, surveillance and reconnaissance role over Syria and Iraq since the start of Operation Inherent Resolve, as Babak Taghvaee recounts. Meanwhile, Arnaud Delalande begins a new series investigating sub-Saharan Africa’s ‘small air forces’, beginning with Benin, Ghana and Togo. 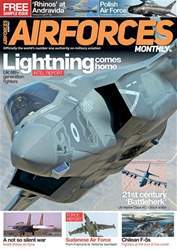 Alongside the latest military aviation news, regular features include Intel Report with Alan Warnes visiting California to get the lowdown on the US Air Force’s assistance to aerial firefighting operations. Force Report features the changing fortunes of the Serbian Air Force and Air Defence, while Air Power Association President, Air Marshal (Ret’d) Greg Bagwell CB, CBE looks at the airlift ‘muscle’ that sustains every aspect of modern military air campaigns.